When Germany invades Poland in 1939, seventeen-year-old Severin Fayerman sees his world change forever. His ­family’s factory is seized by the Germans and life grows ­increasingly difficult. Inevitably, the Fayermans are arrested and sent to a forced labor camp. Severin, separated from his family, is left alone in captivity. For more than a year, he endures the horrors of Auschwitz, Buchenwald, and other concentration camps, relying on hard work and ingenuity to survive. When the war ends so does his nightmare, but his journey has only just begun. 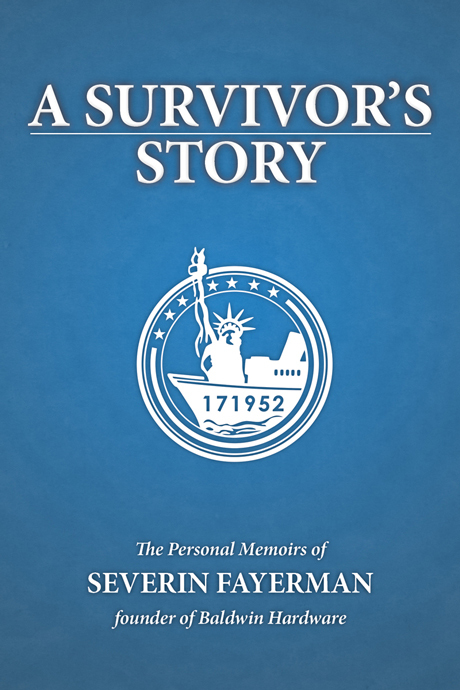 A Survivor’s Story is the inspirational memoir of Severin Fayerman, Holocaust survivor and the founder of Baldwin Hardware. His journey from Poland to the United States, from young boy to successful businessman, proves that determination trumps adversity, and that goodness can shine in the darkest of places. His story is the American dream. Severin Fayerman was born in Bendzin, Poland in 1922. During World War II, he survived imprisonment and forced labor at Auschwitz and Buchenwald concentration camps. Reunited with his family after the war, he emigrated to the United States in search of a new life. In 1946 the Fayermans purchased the Baldwin Tool and Die Company in Newark, New Jersey. Together they transformed the small metal forming business into a world-class operation. Today, Baldwin Hardware is a premier manufacturer of locks and hardware, and a testament to Severin’s hard work and entrepreneurial spirit.